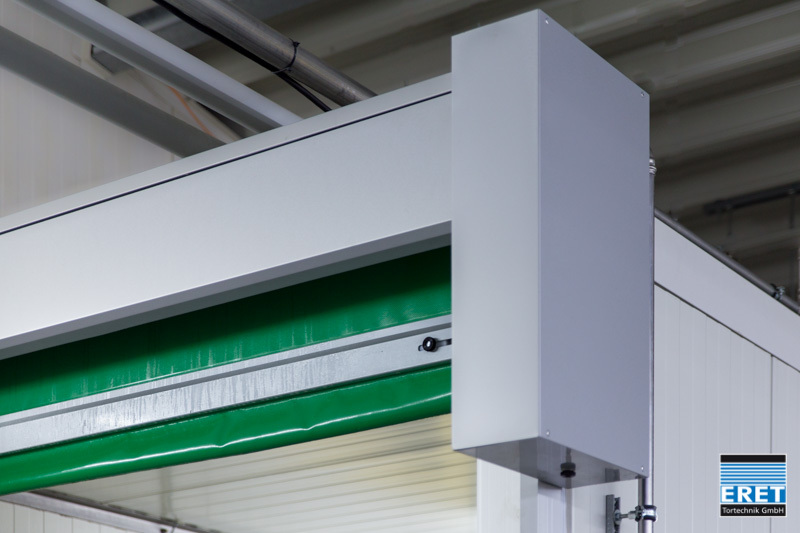 High-speed doors can be used externally as a room partition optimal for separating various production areas or. The curtain can be optionally made of closed PES / PVC or fly screen – be prepared tissues. The guide rails are preferably carried out in aluminum anodized, all steel parts in stainless steel, usually V2A. In addition, larger doors with a drive and shaft lining – be equipped – with a sloping roof. In Anbhängigkeit the cleaning chemicals used is pre compatibility check with aluminum, steel and stainless steel. In most cases, set the standard anodized surfaces already optimum corrosion protection. On the use of expensive stainless steel can be dispensed with. Drive and control receive a higher protection class (Most IP65 / IP67). Cleaning agents can damage a hochempflindliche contact bar. Therefore, we consistently a non-contact optical lattice. The light grids are concealed within the side panels. The sealing of the soil is ensured by means of a curtain pocket. The curtain pocket is closed laterally and can be easily and inexpensively replaced if damaged. Upon request, the goals will be set so that the curtain pocket off the ground to avoid the risk of draining of liquids. This may be especially important for unpackaged foods and frequent floor cleaning. The control cabinet is mounted either outside the “wash down” area or performed with a V2A housing with angled roof and IP67 protection. The PES / PVC used in goal is food safe. 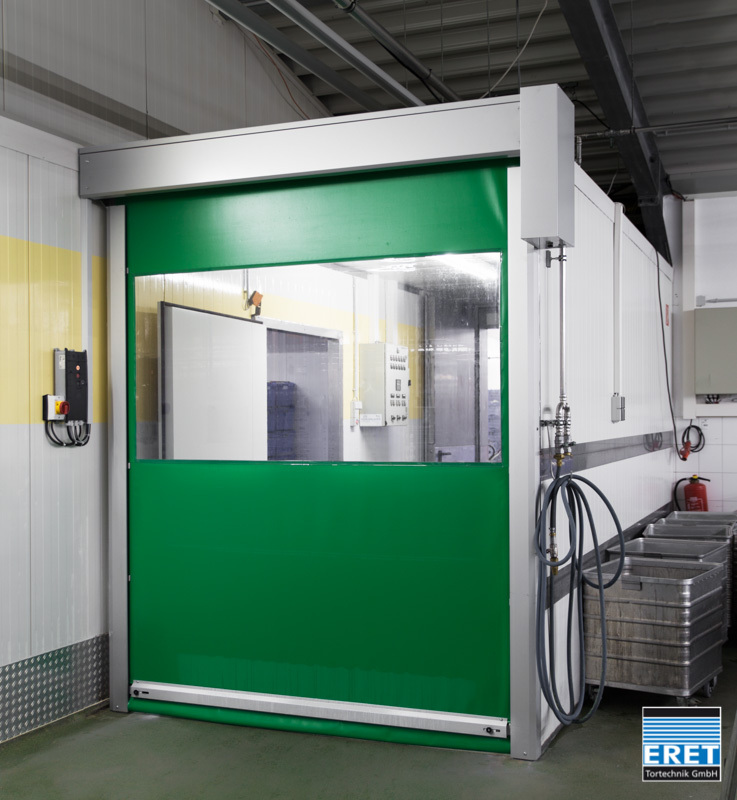 In the days of operation, the high speed door is opened in Automatikbetieb for each transit or passage and closed as quickly as possible. For automatic operation, all common activators such as motion detectors, induction loops, hauling cable can be connected, etc.. Since the gate systems usually run automatically, the use of surveillance as personal and property protection is recommended. Take advantage of many optional extras are available. Thus, the doors can be tailored to the particular circumstances. Speed ​​(Close) 0.8 m / sec.